The basics for dance class! A dancer's equipment is just as important as hockey pads. Form, posture, movement and flexibility are key to a dancer's success. Proper dancewear is made from technical fabrics that breathe, move, contour, and flatter the dancer's body. Fabrics and construction are high quality and will stand up to movement, sweat and several washings! Basics include bodysuits or leotards, skirts, dresses, tops, shorts, pants, ballet sweaters, undergarments and more. Stunning racer-back crop top with mesh inserts for tweens to adults. Perfect for dance, gym, and other athletics! Pull-On Wrap Skirt by Motionwear is a crepe ballet skirt featuring a comfortable stretch cotton waistband and is available in several colours. 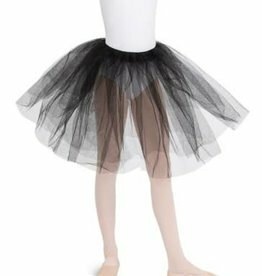 Romantic length tutu by Capezio for dance class, dress up, or costume. Add to your favourite bodysuit for a true ballerina look. 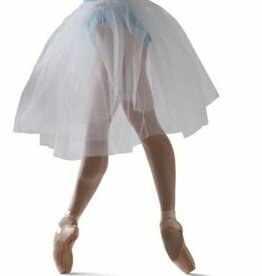 Classic romantic tutu made of nylon tulle is a ballet dancer's ultimate accessory. Can be used in ballet or other dance class for rehearsal, performance, costuming or auditions. Adult sizes. Cotton Classics short sleeve leotard by Mondor is a basic ballet or dance bodysuit. Suitable for all types of dance, this well-made classic style is a staple in any dancer's wardrobe. Printed cami crop top for dancers features a double cross back strap. The pattern adds a touch of spring to your dance wardrobe! Matrix crop top for young dancers features a camisole strap design. Classic style for dancers in jazz, tap, contemporary or gymnasts. Chiffon wraparound ballet skirt, RAD approved (Royal Academy of Dance licensed product), is available in several colours, can be used for dance class, exams or performance.